Hortus Camdenensis | Abutilon venosum Lem. Frost tender shrub or small tree with 5 or 7-lobed leaves, to 23cm across, and solitary, axillary, golden yellow flowers veined with reddish-brown, to 5cm across. [RHSD]. ‘A large green-house shrub, or it may almost be called a small tree, the name of which we have only seen in print in a Catalogue of the Plants of the Botanic Garden of Zurich, marked "Abutilon venosum, Hort. Zuric." It appears to have come to England by way of Belgium, and we have no information of its native country; but if we judge from its affinity with Sida Bedfordiana (Bot. Mag. t.3892) and S.picta (t.3840), we should infer that south Brazil is its native country. Of the two species just mentioned, it is most nearly allied to S.picta, on account of its palmated leaves; but the segments of the leaves, and the flowers, especially the structure of the calyx, are very different. It blooms in the spring and summer, and our earliest knowledge of it was from a fine specimen brought to us by Robert Barclay, Esq., who had flowered it at Nott's Green, Leytonstone. The blossoms are large and exceedingly handsome, from the rich colour and fine purple veining of their petals. […] A slender, upright, soft-wooded, shrubby plant of rapid growth, soon becoming tall and naked below, and therefore better adapted for planting out in a greenhouse conservatory, than for cultivating in a pot. In either case it is desirable to shorten the leading shoots, so as to induce it to branch. It will thrive well in any good garden-loam, mixed with a little leaf-mould or sandy peat-soil. During summer it requires to be freely supplied with water, and may at that season be fully exposed to the open air. 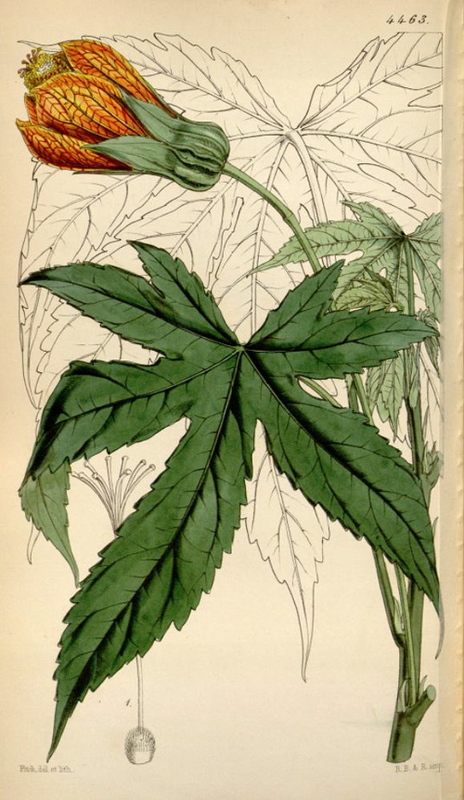 It is readily increased by cuttings, treated in the usual way.’ [BM t.4463/1849]. FS t.5/1846. Listed only in an 1850 catalogue held at the Mitchell Library and inscribed on the front Wm. Macarthur, 23rd Dec. 1854. [ML635.9m]. This almost certainly indicates that it was grown in the gardens at this time.